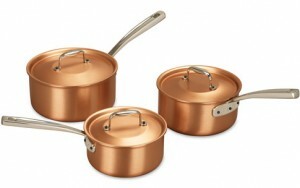 Copper Cookware: Is it the one for you? One of the important considerations of a chef in choosing the cookware to use is its heating capacity. It is also important that heat is distributed evenly and consistently on the cookware. 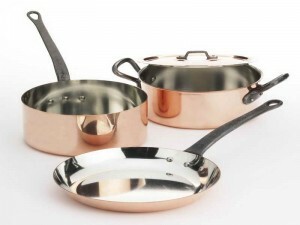 It is for this reason that copper cookware is preferred by most chefs. Copper pans are normally made of various plies of different metals. Some of the metals that may be layered with copper are stainless steel, aluminum and nickel. Both copper and aluminum are good heat conductors thus this tandem on a cookware is very ideal. To give you an idea on whether copper pots and pans are the right cookware for you, let me discuss some of it positive and negative points. As earlier stated, a copper cookware set is preferred by most chefs. This in itself is almost a guarantee that it works well with most dishes, especially those you love ordering in a restaurant. 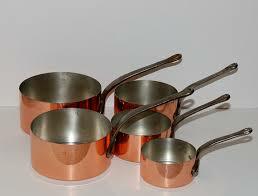 Copper cookware sets are sturdy as the copper metal is not brittle and is almost unbreakable. It is also one of the reasons it is preferred as even if you use it day in and day out, it does not easily give in to wear and tear which makes it economical in the long run. Copper pots, a copper frying pan and other copper cookware look really classy. When not in use, they could serve as impressive decors around the kitchen. You could put them in display by hanging them on your kitchen walls. There is no need to hide them inside the kitchen cabinets. ed if you have a copper pan or a copper pot set as you could use these a accent colors to your kitchen. Copper is a good thermal conductor. It is known to evenly pan out heat evenly and consistently. In this aspect, it is far superior that its other metal counterparts like the aluminum. It is also more superior to glass. Since pots and pans made of copper have good thermal conductivity, it shortens the period of time you have to cook a dish compared when using cookware made of other materials. 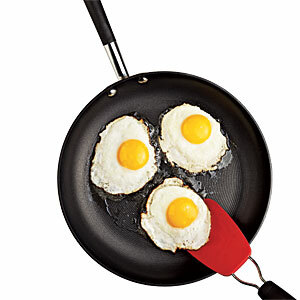 Cookware with good heating capacity emits heat faster, better and evenly. This also lets you avoid the common problem of having hot spots when cooking. Copper cooking pots make polishing optional as copper looks good even without polishing. Unpolished copper gives out a rustic look so if you have a knack for this vibe; you only need to do regular cleaning without having to polish every now and then. However, if you like shiny cookware, then polish away! Copper gives you these options and a lot more. The outer layer of copper pots and pans set, where the cooking happens, is layered or covered by another metal like stainless steel because copper cannot interact with food. With a smooth stainless steel finish, cleaning the cookware becomes easier. There are several techniques you can find in the internet on how to clean copper pots and pans. Copper pots and pans are all these great but of course, there are a few points to watch out for before you can finally decide this is the right type of cookware for you. These are some of the negative things I observed or experienced with copper pans and copper pots. Copper is almost an unbreakable metal but it is prone to become deformed as it is malleable. This is also one of the reasons why it is bonded with other metals when creating a cookware, aside for the fact that copper is toxic and cannot interact with food. Copper is a heavy metal so obviously a copper cooking ware weighs more than other cookware made of other lighter metals. You must take this in consideration especially if you are petite. Even the best copper cookware is flawed with being prone to discoloration after so many uses. Also, if you do not clean it well, patina may develop on the exposed copper of the cookware. 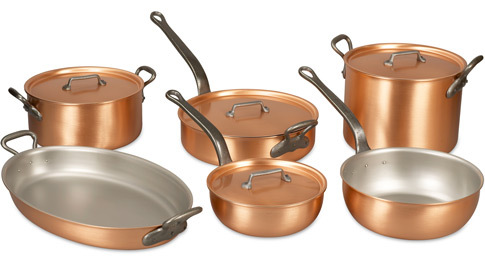 If you are on a limited budget, one of the major turn offs of a copper cookware is its cost. The price may almost be double of a regular cookware where other types of metals were used. As mentioned in the first point, copper is toxic and will react to food so it is coated with another non toxic metal for the part where you do your cooking. You have to take extra caution not to scrape off the non toxic metal coating so you could still use your copper cooking ware. Now that you know the strong and weak points of copper pots and pans set, you can more or less decide whether this is the suitable cookware for you. Copper has the reddish-brown color which looks very appealing that may exceptionally entice the cook in creating sumptuous dishes. It is extremely common nowadays that a kitchen has a red theme color because the color red stimulates the appetite. Now, you don’t even have to paint your kitchen red if you have a copper pan or a copper pot set as you could use these a accent colors to your kitchen.